If you're in Mumbai on Feb 8, do try and drop in for a panel discussion on "films and literature" at the Kala Ghoda Arts Festival at 8 pm - I'll be on it, as will be Anuvab Pal (who wrote the Disco Dancer book for the Harper Collins film series), Samit Basu and Zac O'Yeah (who are known to enliven anything they participate in) - that's a fine lineup of people, even if I say so myself. 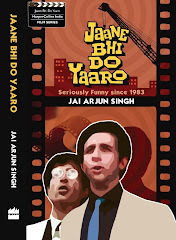 And yes, the Jaane bhi do Yaaro book will be available at the venue too. Full schedule of literature events at Kala Ghoda here.